We first looked at Joseph Smith's life and the bizarre discovery he claimed to have made which founded the Mormon cult. Now we'll look at Smith's status as a prophet. The first of these is an oral prophecy he supposedly gave on August 6, 1842 in which he prophesied that the Mormons would continue to suffer affliction until they moved to the Rocky Mountains where they would become "a mighty people. "7 This prophecy is contained in the diary of a man named Anson Call, but the prophecy was not recorded by Mr. Call until 1845 (after Smith's death), and it appears as an interlinear insertion which experts have determined was added after the Mormons actually arrived in Utah. The third prophecy that supposedly validates Smith as a true prophet of God is one given in February of 1844. Smith prophesied that "within five years the Mormons will be out of the power of their enemies. "9 This prophecy came true. By 1849, the Mormons had set up their theocracy in Utah and were no longer plagued by their enemies. Perhaps Smith's most spectacular prophecy is one he supposedly made in 1839.10 It was not recorded at the time, but it is quoted in many Mormon historical documents. Smith stated that the wrath of God was hanging over Jackson County, Missouri (because of the way Mormons had been treated there). He warned that if the people of the county did not stop persecuting Mormons, "you will live to see the day when it [the county] will be visited by fire and sword... the fields and houses will be destroyed, and only the chimneys will be left to mark the desolation." But what Mormons conveniently overlook are the myriad of prophecies Smith gave which were never fulfilled — prophecies that clearly mark him as a false prophet. Prophecy #1 — Temple to be built in Independence, Missouri. In September of 1832 Joseph Smith prophesied that the New Jerusalem and a new temple would be built in Zion, Missouri, a site near Independence.13 He further stated that his generation would not all pass away until these events took place. The temple was never built in Smith's lifetime or within the generation of his contemporaries. The Mormons were driven out of Missouri in 1839. The site where the temple was to be built is not even owned today by the Mormon Church. Prophecy #2 — The End of all nations. In December 1832 Smith prophesied that South Carolina would rebel against the federal government, resulting in a war that would spread worldwide and would result in the "full end of all nations. "14 Nothing needs to be said about the failure of this bizarre prophecy. Prophecy #3 — The Return of the Lord. In 1835, as the prophecies of William Miller were growing in popularity, Joseph Smith stated that "the return of the Lord is nigh — even fifty-six years should wind up the scene. "15 The 56 years passed in 1891. In a diary entry dated April 6, 1843, Smith repeated this prophecy, stating the Lord would return when "I am 85 years old, 48 years hence, or about 1890. "16 Smith was killed when he was 39 years old. Prophecy #4 — The Liberty jail prophecies. In March of 1839 Smith issued a whole package of prophecies from his jail cell in Liberty, Missouri.17 Among other things, he predicted that his enemies would be destroyed "by the sword," that his friends would never charge him with transgressions, and that God was about to change the times and seasons. None of these prophecies came true. The enemies of the Mormons were not destroyed, God did not change the times and seasons, and Smith's friends did turn on him with serious charges that ultimately led to his arrest and death. Prophecy #5 — The United States Government to be overthrown. In May of 1843 Smith prophesied that if the United States government did not redress the wrongs suffered by the Mormons in Missouri, the government would be "utterly overthrown and wasted. "18 The federal government rejected the Mormon petitions and their "wrongs" were not redressed, yet the U.S. government continued to exist. Prophecy #6 — His son to succeed him. In April 1844 Smith prophesied that his son would succeed him and would become "president and king of Israel. "19 The child was named David. Needless to say, he never became "president and king of Israel." Nor did he succeed his father. He died in 1904 at the age of 60, after spending the last 27 years of his life in an insane asylum. Many of Smith's incorrect prophecies, like the one concerning his son, were related to individuals. For example, in 1835 he prophesied that Orson Hyde would go to Jerusalem and prepare the way for the regathering of the Jewish people.20 Hyde never went to Jerusalem. In like manner, in 1837 Smith prophesied that the president of the Church's Council of Twelve Apostles, a man named Thomas Marsh, would go forth "unto the ends of the earth" to preach to both Jews and Gentiles.21 Less than two years later, Marsh was excommunicated! In 1841 Smith declared that a fellow named George Miller was a man "without guile" who could be trusted, and that no man should "despise my servant George, for he shall honor me. "22 Seven years later, George Miller was excommunicated. 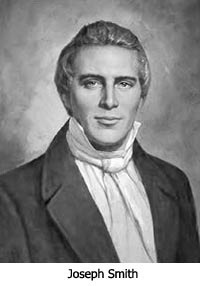 When you consider Joseph Smith's sordid record of failed prophecies, can there be any doubt that he was a false prophet who spoke for anyone except the true God of this universe? "For although a man may have many revelations, and have power to do many mighty works, yet if he boasts in his own strength, and sets at naught the counsels of God, and follows after the dictates of his own will and carnal desires, he must fall and incur the vengeance of a just God upon him." "Come on, ye persecutors, ye false swearers! All hell boil over! Ye burning mountains, roll down your lava! For I will come out on the top at last. I have more to boast of than any man had. I am the only man that has ever been able to keep a whole church together since the days of Adam. A large majority of the whole have stood by me. Neither Paul, John, Peter, nor Jesus ever did it. I boast that no man ever did such a work as I. The followers of Jesus ran away from Him; but the Latter-Day Saints never ran away from me yet." These startling words make it clear that in the short span of 16 years, Smith became an ego-maniac. He became the epitome of the arrogant man he warned about in his prophetic statement in 1828. One month after his blasphemous sermon, his 1828 prophecy was fulfilled when he was killed by his enemies. 7) Jerald and Sandra Tanner, Major Problems of Mormonism, Utah Lighthouse Ministry, 1989, pp. 85-86. 9) Joseph Smith, History of the Church, Salt Lake City, Utah, 1901, seven volumes, vol. 6, p.225. 10) Nephi Lowell Morris, Prophecies of Joseph Smith and Their Fulfillment, Salt Lake City, Utah, 1926, page 180. 11) Harold Schindler, Orin Porter Rockwell, Salt Lake City, Utah, 1966, pages 108-109. 12) Richard Packham, "Joseph Smith As A Prophet," www.exmormon. org/prophet.htm, accessed 9/11/2003. 13) Church of Jesus Christ of Latter-Day Saints, Doctrine and Covenants, Salt Lake City, Utah, many editions, section 84:2-5,31. A copy of this publication can be found on the Internet at the following address: www.lds.org. 15) History of the Church, vol. 2, p. 182. 16) Doctrine and Covenants, section 130:14-17 and History of the Church, vol. 5, p. 336. 17) Doctrine and Covenants, section 121:5-15. 18) History of the Church, vol. 5, p. 394. 19) Michael D. Quinn, The Mormon Hierarchy, Salt Lake City, Utah, 1994, p. 644. 20) Prophecies of Joseph Smith and Their Fulfillment, p. 261. 21) Doctrine and Covenants, section 112. 24) History of the Church, vol. 6, pp. 408-412.